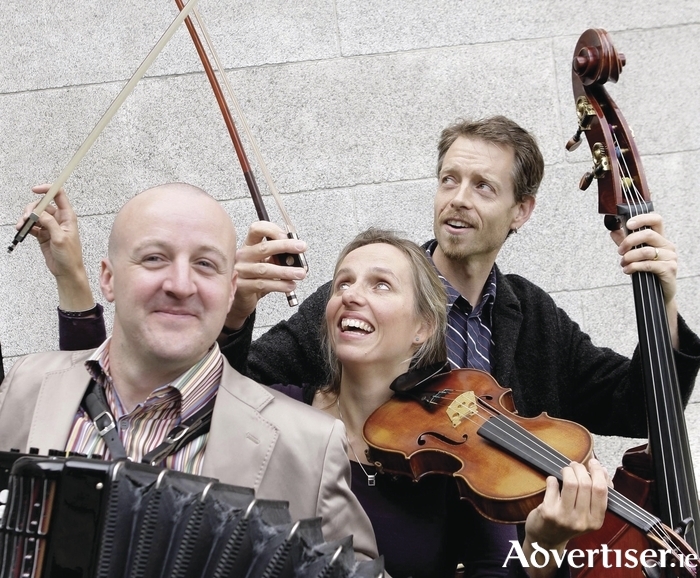 Virtuoso violinist Katherine Hunka, accordionist Dermot Dunne, and double-bassist Malachy Robinson, play the Mick Lally Theatre, Druid Lane, Galway, on Wednesday January 20, and the Station House, Clifden, on Monday February 22. Katherine Hunka is the leader of the Irish Chamber Orchestra, has performed as a soloist, toured with pianist Hugh Tinney and cellist Guy Johnston, and over the years worked with Dermot Dunne. Dunne has played the National Concert Hall, Vicar Street, Belfast Opera House, and the BBC Last Night at the Proms. He has also worked with The Blind Boys Of Alabama, Altan, and Katherine Jenkins. Malachy Robinson is a colleague of Katherine in the ICO and is also involved in the Gregory Walkers, the Robinson Panoramic Quartet, and the Crash Ensemble. He performs with period instrument orchestras and chamber music ensembles.